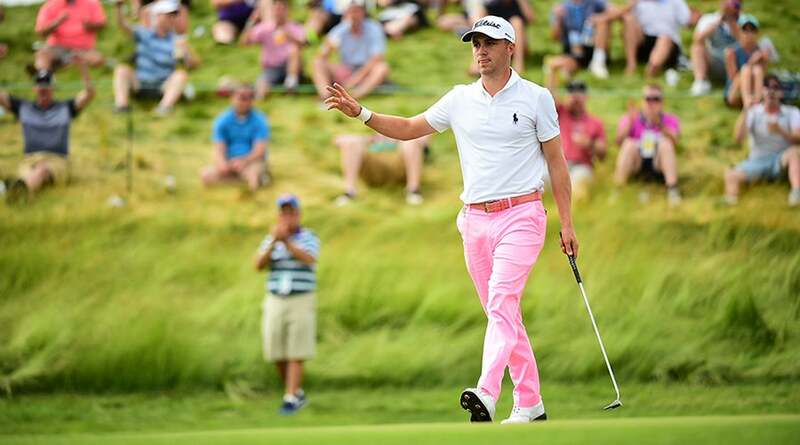 ERIN, Wis. – Under blue skies and with a gentle afternoon breeze blowing across this heaving property, Justin Thomas stood over his ball in the 18th fairway, 299 yards from a place in history. He curled his fingers around his three-wood and took a lash. His ball rocketed through the muggy air, never leaving its line. "Oh my gosh, Jimmy, be good," Thomas said. "Did you hit it good?" asked his caddie, Jimmy Johnson. He hit it good. Thomas's ball landed softly on the green and settled eight feet right of the hole. When the eagle putt dropped dead center for a historic 63, Erin Hills shook. The 24-year-old bumped fists with his playing partner, Jonathan Randolph, and strolled off the green. His nine-under total was the lowest score relative to par in 117 editions of the U.S. Open, breaking Johnny Miller's 44-year-old record. Now comes the really hard part: winning the tournament. "I'm not sure when it's going to sink in or when I'm going to realize what I did," Thomas said. "I know one thing: If it happened tomorrow and the result is what I want it to be, then I'd probably have a little different feeling." You can't blame Thomas for failing to revel in his achievement for too long. He and the rest of the field still trail 30-year-old Brian Harman, who shot 67 and leads Thomas, Brooks Koepka and Tommy Fleetwood by one shot through 54 holes at gettable, rain-softened Erin Hills. Harman could become the first lefty to win a U.S. Open. He's not a big hitter, but he's missed just five fairways this week. "I got off to a pretty good start, which I really haven't done yet," he said. "Struck it well, had a couple putts that could have gone that didn't, but had a bunch of looks, hit a bunch of greens, and that's what you've got to do to play well around here." Harman is in the throes of his best season on Tour. He won the Wells Fargo Championship last month, his second career title, and has four other top-10 finishes. The media guide lists him at 5-foot-7—um, in his golf spikes, maybe. He's never cracked the top 20 in a major – heck, he's never even made a cut at a U.S. Open. "We're breaking down all kinds of barriers," he said. But he exudes confidence, and he'll need every ounce of that self-belief Sunday afternoon. There are 16 players within six shots of him. Thomas turned in a highlight reel-round. He drained a putt that turned 90 degrees on No. 4. He drove the green on the par-4 15th. He said that he was merely trying to birdie 18, but his magnificent three-wood from the fairway set him up for a 3. The fans let Thomas hear it all day long. "I was blown away by the support that I got today and this week," he said. "They made me feel like they were pulling for me and helping me through that finish." Thomas's pyrotechnics were the main event on a day filled with thrilling shots and wild scoring swings. It was dizzying, disorienting, electrifying. The final pairing of Harman and Paul Casey hardly got a ball in the air before a new pack of challengers emerged. Brendan Steele and Marc Leishman charged. Charley Hoffman was the first to reach nine under. When Thomas jarred a 27-footer on 17, he grabbed the lead alone—for two minutes. Fleetwood drilled a 22-footer on the 8th hole to tie him. When Thomas stood over that three-wood in the fairway on 18, he was part of a seven-way tie. A seven-way tie! Patrick Reed was among the early movers. Clad in red, white and blue for the third straight day, America's Ryder Cup hero teed off more than three hours before the leaders and fired a 65, even with a lipped-out five-footer on 18. Is he fired up to win his national championship? "Oh, for sure. I mean, it's where we're from. It's home," he said. "To go out and just play well tomorrow and have a chance to win the golf tournament would mean a lot." Erin Hills was set up for scoring, but a few contenders failed to capitalize. Overnight co-leader Paul Casey shot 75. Jamie Lovemark put up a 74. Jordan Spieth, a close pal of Thomas's, shot 76. "I hit the ball phenomenal, just didn't make anything," he said. Then there was the first-round leader, Rick Yutaka Fowler, better known out here as Rickiiiiiieee. When he strolled onto the first tee Saturday afternoon to shake hands and grab a few supplies, a young fan a few feet away leaned over the ropes and gasped as if Fowler had just walked on water. "That's so sick!" he said. The youngster was 14-year-old Charlie Haggerty of Chicago. "I like his swing. He has a unique style," he said, speaking for all of Rickie Nation. There is a deep roster of players with a chance to win tomorrow, but Fowler is the only one who can thrill fans by plucking a pencil from a cardboard box. And he's still in the thick of things, just two back. On the 8th hole, with his ball on the bottom of the multi-tiered green, Fowler elected a wedge over his putter and chipped his ball over a mound. He made bogey but rallied with three straight birdies on the back nine that produced the loudest roars of the late afternoon. On 18 he drove into a bunker but saved par and signed for 68. Fowler is already a star, but a win at Erin Hills would provide something greater: validation. It would do the same for Thomas and Reed, not to mention Harman, Koepka and Fleetwood. There are probably 10 or 12 players who can still win—and none has ever won a major. Shortly after Thomas finished off his record round, Paul Azinger said on the broadcast what many might now be thinking: "I'm scared of Justin Thomas." The day indeed belonged to J.T., but will the title?